The Bibbidi Bobbidi Boutique is a salon at Disney World dedicated to creating magical Disney Princess makeovers guaranteed to delight any little girl. The Bibbidi Bobbidi Boutique offers three different hairstyles to choose from, and features the costumes of some of the most beloved Disney Princesses, including Anna, Elsa, Snow White, Ariel, Cinderella, Aurora, Belle, Tinkerbell, Tiana, Rapunzel, Merida and Jasmine. Depending on the package you purchase, your very own Fairy Godmother will complete the magical transformation in about a half hour. The Bibbidi Bobbidi Boutique isn't just for girls! Sign up your favorite young man for a knightly makeover, which includes colorful hair gel with confetti, and cool sword and shield. The boys "Knight" package is a major bargain, starting at just $19.95 and is offered at both Bibbidi Bobbidi Boutique locations. If you have selected the deluxe Castle Package, your little girl will select the Disney Princess she wants to be, and will be whisked away to the dressing room for a new princess dress, shoes and accessories. Next, she will be assigned her own Fairy Godmother and makeover station. You can select from three packages for hair and makeup, ranging from traditional Cinderella style up-do complete with a sparkly tiara, to a fun and funky pop princess with multi-color hair extensions and glittery Mickey hair clips. The makeover begins with hair, and the Fairy Godmothers are wonderful at creating picture-perfect styles that last — once "made-over" your new hairstyle will last until you wash it out. After the hairstyle is complete, your little princess will receive a light coat of glittery makeup and a choice of sheer blue or pink nail polish. A final sprinkling of pixie dust, and the makeover is complete. All transformations are done facing "away" from a mirror, and the final reveal is both magical and dramatic. All makeup, nail polish and hair accessories are presented to your princess in a pretty pink to-go cinch bag, so she can maintain her look. Fresh items are used in each makeover for hygienic reasons, and to provide each new princess with a lovely memento of her special day. 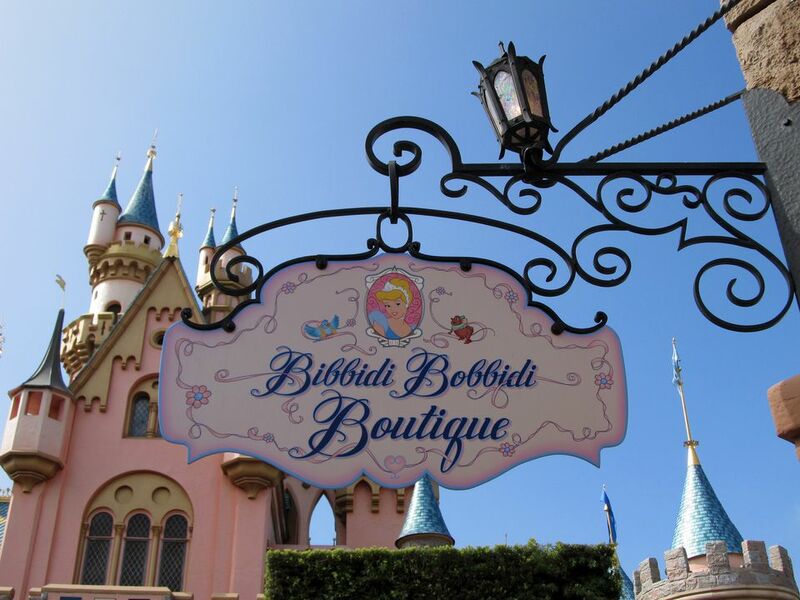 The Bibbidi Bobbidi Boutique has two locations, one at Cinderella Castle, right in the middle of the Magic Kingdom, and one at the Once Upon a Toy store at Disney Springs Marketplace (formerly Downtown Disney). Both locations offer the same services, but one may suit you better than the other. If you want to be right in the heart of the magic of Disney World, then choose the Cinderella Castle location. If you prefer shorter wait times and less of a crowd, check out the Downtown Disney location for a more convenient makeover. You must make a reservation for the Bibbidi Bobbidi Boutique; walk-in appointments are rarely available. Be sure you arrive early for your appointment, and set aside about two hours for the process. Wait times will vary, so booking one of the first appointments of the day may save you some time. The waiting area can be crowded, so consider bringing "just" your princess-to-be, and not the entire family to the Boutique. To book your appointment with a Fairy Godmother-in-Training, please call (407) WDW-STYLE or (407) 939-7895. A valid credit card number is required at the time of booking. In case you do not show or you cancel the reservation within 24 hours of the scheduled time, a $10 cancellation fee will be applied to your credit card. Children must be between the ages of 3 and 12 to participate and must be accompanied by an adult (at least 18 years of age). Certain accessories are sold separately and costume selection and sizing may vary. There are several different pricing tiers, ranging from $59.95 to over $200, depending on the amount of costuming, accessories and photos desired. A Disney PhotoPass photographer will be on hand to take pictures during and after the makeover, and you may bring your own camera as well. If you want the experience without a huge price tag, bring a Disney Princess dress from home, and wear it to the Bibbidi Bobbidi Boutique. The experience is just as magical, but the dress is the most expensive part of the package, so bringing your own will save money on your makeover.